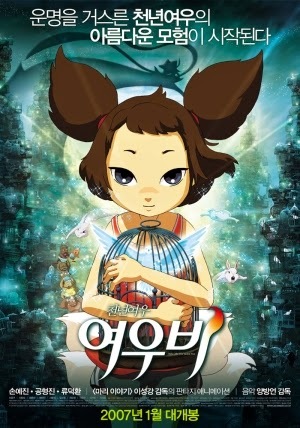 A 2007 animated Korean film by Lee Sung-gang, the director of My Beautiful Girl, Mari. The film loosely draws upon the Korean folk tales of the kumiho. "A long time ago, foxes with nine tails called the Goomiho lived in the deepest parts of the mountains. These animals had the ability to transfigure into other animals or human beings, and some of them actually became humans by taking the human's soul. People became scared of these animals, and began hunting them down. The foxed returned back to the far realms of the mountains, never to be seen again. On day, aliens crash-land on Earth and find a little Goomiho abandoned in the mountains..."
Teacher Kang takes his students to a school that sits at the base of a hill where Yeoubi [Yobi] lives, a five-tailed fox who can turn into any form. Kang and his students are there to train at a special centre for honing their mental abilities. While the students test their courage at night, Yeoubi encounters the dream-catcher Hwang Geum-yee. Yeoubi develops an interest in Geum-yee, and decides to join the students to stay closer to him. Living like a human being is fun, until she comes across the fox hunter. Rescued by a mysterious shadow, Yeoubi now faces the inevitable — by taking Geum-yee's spirit that will make her a real human being.